Each voyage is inspired by the itinerary onboard Star Princess®, with a changing menu in the main dining room reflecting local cuisine, and enrichment activities held across the ship to engage and excite all ages about each destination's culture. Of course, you'll still find reminders of home like the British pub lunches in the Wheelhouse Bar, and a swimming pool with retractable roof for when the weather turns unexpectedly! 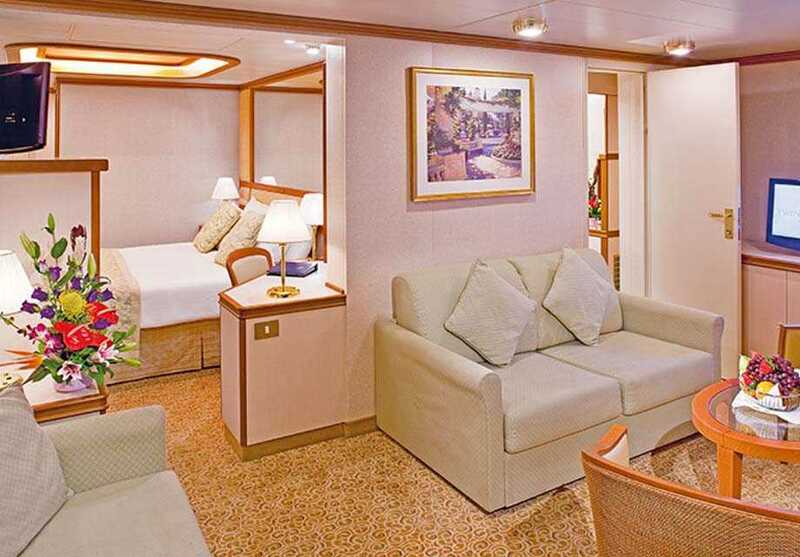 Your home from home promises to be cosy and welcoming, decorated in warm tones and ideally situated across various levels of the ship. 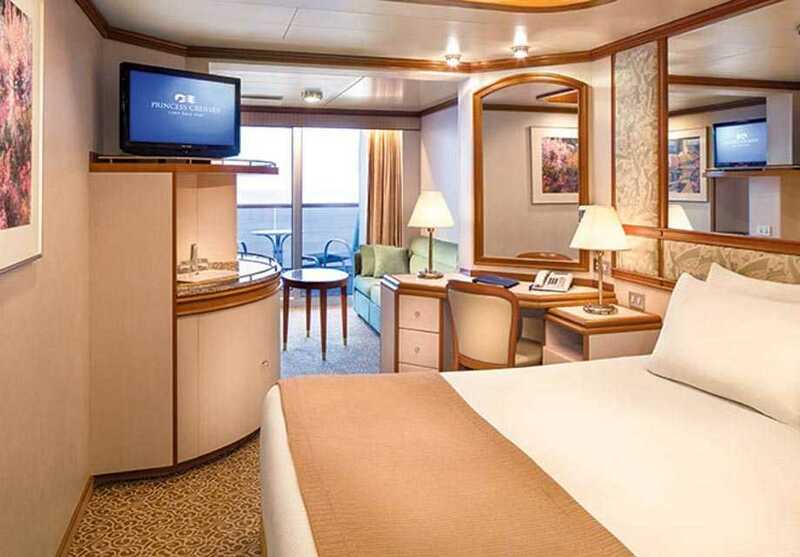 Princess Cruises offer you the flexibility to dine as you wish, with traditional dinners as well as 24-hour snacks. From indulgent Norman Love chocolate collections to designer jewellery and perfumes, shopping onboard is a delight. 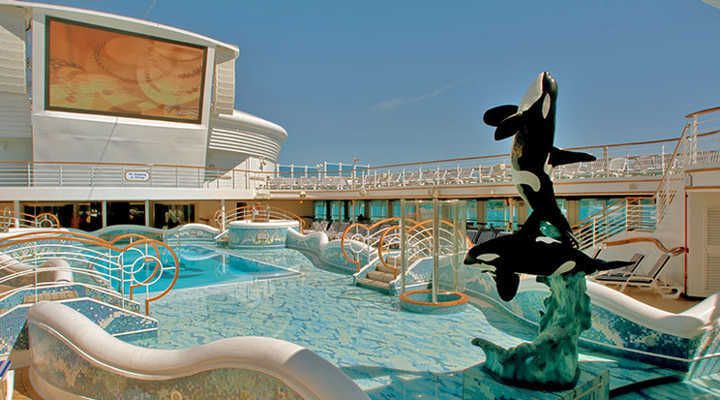 Find a range of cool bars and sleek lounges onboard your Princess cruise ship. The aptly-named Sanctuary is a serene adult-only retreat for total relaxation, while the Lotus Spa® offers a range of holistic treatments. Keep up-to-date with leisure opportunities with the free mobile-friendly Princess@Sea service, where you'll find a schedule of daily activities. Families are made welcome on Princess Cruises, with a range of exciting activities for your young entourage. The magic of Academy-award winning composer Steven Schwartz and the catchy tunes of live musicians create world-class cruise entertainment. Overlooking the Calypso pool, the Conservatory is a favourite with families, including a retractable roof for when the weather takes a turn. Enjoy memorable views from the plush loungers whilst still being able to keep an eye on the little ones splashing away. Plush loungers around the poolside become your cinema seat for the night, with a huge movie screen showing first-run feature-length films under the stars. Adorned with maritime memorabilia, the Wheelhouse Bar has a distinctly nostalgic feel, with trivia games and lectures held here during the day, and Latin music by the Tito Cruz Quartet after sunset. Situated in the grand Piazza, the International Café is open 24-hours for any time dining. You'll find a range of international dishes and snack selections, including grilled paninis, fresh salads, homemade soups and tasty desserts. With 4 swimming pools and 9 whirlpool spas to choose from, there's plenty of opportunity on board to soak, swim and savour those incredible ocean views from the outdoor deck. Choose from the Oasis Pool and bar, the family-friendly splash pool, or the indoor Calypso Reef & Pool with hot tubs. Honouring Princess Cruises' Italian heritage, this inviting Neapolitan-style pizzeria serves freshly-baked, hand-tossed pizzas made just how you like it. Choose from a range of toppings, including daily specials and classic favourites like margherita and pepperoni. Tucked away in the atrium, Vines is a refined wine bar, boasting an extensive selection of fine wines like Opus One and Super Tuscans. Savour your chosen glass with perfectly paired, made-to-order sushi and tapas. Regional offerings are also available for purchase. Situated on the top deck, Skywalker's is a vibrant and funky nightclub serving a range of speciality cocktails and cool drinks. The central dance floor dotted with coloured lights is the perfect spot for late-night lively dancing. Adjacent to the glittering Casino, this glitzy bar serves as both your Dutch courage pre-roulette spin and your post-win celebrations, with live musical entertainment from the resident pianist. A beautiful sail away location on the deck, the Outrigger Bar serves a range of alcoholic beverages and soft drinks, as well as snacks and light bites. Located on the Lido deck, Calypso is a trendy bar with a marine theme, serving light drinks to refresh by the pool throughout the day. A relaxed outdoor bar on the sundeck, Tradewinds serves cool drinks, premium spirits and fine wines throughout the day. Overlooking the lively piazza, Crooners Bar is located on the Promenade Deck and offers musical entertainment, from live pianists to swinging jazz bands. Situated in the social hub of the ship, the Lobby Bar is a great spot to grab a drink, people watch or participate in some of the ships' daytime activities and entertainment. The live pianist in the Promenade Lounge & Bar plays guests' favourite songs on request, as well as a selection of classics. Sip and savour the delightful atmosphere and watch the world cruise by! A relaxed outdoor bar by Neptune's Reef and Pool, Mermaid's Tail serves satisfying snacks, light bites and sweet treats throughout the day. Shooter's Bar is a refined smoking and sports bar where guests can keep up-to-date with home games in the big TVs and socialise over a Cognac and smoke. Inspired by the natural beauty of Tuscany, Sabatini's is reminiscent of an Italian home, welcoming you with home-cooked signature pasta dishes and fresh seafood specialities. Favourites include the garlic-infused shrimp with cherry tomatoes, and the braised short rib served over a bed of penne pasta. Reservations recommended. Cover charge applies. Adorned with rich wood décor and featuring an open kitchen as a centrepiece, the Crown Grill is an authentic steakhouse serving cooked-to-order steaks as well as a range of fresh, premium seafood such as lobster and grilled shrimp. Reservations recommended. Cover charge applies. A firm favourite with families, Horizon Court is a delightfully relaxed setting for breakfast, lunch and dinner. Buffet selections include hearty home-style dishes and a loaded salad & fruit bar so kids won't miss out on their 5-a-day! Refresh on the sun-drenched deck with a cool ice cream from Scoops. You'll find an impressive range of flavours, including classics like vanilla and chocolate, as well as a selection of sweet toppings like gummy bears, cookie crumbs and nuts. Situated on the outdoor deck, Trident Grill is an ideal choice for lunch, serving juicy cheeseburgers, grilled chicken sandwiches and delicious hot dogs. As one of your Speciality dining options, the Crab Shack offers delicious, fresh seafood such as clam, mussel and shrimp pot, or steamed Alaskan king crab legs, as well as a selection of fine wines in an inviting setting. Reservations recommended. Cover charge applies. Situated on the Lido Deck, refresh with a cool ice cream sundae or indulgent waffle dessert at this delightful ice cream bar. Uniquely elegant and catered to your personal taste, the Chef's Table dining experience offers an exclusive behind-the-scenes look at the preparation of your delicious meals and handcrafted cocktails, made by the experts. An intimate table in the main dining room is yours for the night, as you're served a special menu and given wine pairing suggestions to complement your meal. At the end of your dinner, each couple will received an autographed copy of Princess' best-selling cookbook, so you can try your favourite courses at home. The Chef's Table Experience can be reserved by up to 10 guests on select nights. Cover charge applies. Located on the Plaza deck, the Capri Dining Room offers Anytime Dining for dinner, in an elegant setting with waiter service. Your multi-course menu mirrors that of sister dining rooms Portofino and Amalfi and includes 'always available' options too like made-to-order steaks, as well as chicken breast and fresh seafood from the Lotus Spa healthy alternatives menu. Maintaining the cruise tradition of set dinner times at same table with the same waiter, the Amalfi Dining Room is your Traditional Dining option. Dinner menus vary daily and offer the same dishes as sister dining rooms Portofino and Capri, including fresh seafood, hearty soups, seasonal salads, and vegetarian dishes. Princess' signature pasta dishes include the veal ravioli with creamy mushroom sauce, while your home-style option may include the red wine braised beef short ribs with fresh vegetables and mashed potatoes. Adorned with artwork of Italian islands, Portofino Dining Room is your Anytime Dining option with sit-down service for breakfast, lunch on sea days, afternoon tea and dinner. Lunch on sea days varies from Bacardi and Coke-marinated spicy chicken wings, to juicy hamburgers and fresh salads. Your multi-course dinner differs each evening, with a theme menu ranging rom Italian with pan-seared chicken and delicious pasta, to Alaskan with salmon and root vegetable hash. A magnificent theatre adorned with pink and purple hues, as well as a spotlight-scattered ceiling. The design allows for great acoustics and viewing from any seat in the house, for stellar, show-stopping acts and live entertainment. Be prepared to be wow-ed by talented musicians, rip-roaringly funny comedians and dazzling Broadway-style musicals. Bringing the buzz of Las Vegas to the seas, the casino is a dazzling night hotspot for both enthusiastic gamblers and first-time gamers to try their hand at blackjack, poker, thrilling craps and roulette. Tournaments are held for those feeling extra-lucky! Arched windows encircle the lounge while inside you'll find plush, velvet seating for drinks over nightclub-style performances. Slightly tiered with rouge carpets, delightful cocktail tables, and hints of gold in the furnishings, the Vista Show Lounge is a more intimate entertainment lounge where you'll find bingo, cabaret performances, and first-run film screenings. Equipped with the latest video games and movies, football tables and board games, the Fun Zone is a friendly kids' hotspot for the Princess Pelicans (ages 3-7 years) and Shockwaves (ages 8-12 years). For your young entourage, there's kids karaoke, pizza parties and pyjama nights. A sleek centre for Remix teens (ages 13-17 years), activities include jukebox parties, football tables, arts and crafts and video games. Shoot some hoops onboard with basketball facilities and equipment available throughout the day. Tennis enthusiasts will be thrilled to find a Centre Court onboard, as well as facilities for paddle tennis. Choose from up to 40 enrichment classes with the ScholarShip@Sea® Program. Learn how to snap the perfect photo with digital photography classes, become a wine connoisseur with wine tasting sessions, or master the skills of vase painting in the ceramics studio. Visit the library to browse and select classic novels or best-selling biographies, as part of the wide collection of books on offer. The Princess Book Club allows you to share your passion for reading with your fellow guests. A cruise ship favourite, enjoy a classic game of shuffleboard on the outdoor games deck. Stay connected while onboard in the 24-hour Internet Café, where wireless access is available alongside desktop computers. As the centrepiece of the ship, the Piazza is an awe-inspiring hub of lounges, lively cafes and daytime shopping, where you'll find entertainment and activities held throughout the day and into the night. Grand staircases wind down its decks, while sleek bars and lounges line its edges. The Platinum Studio is where guests can capture their cruise memories with beautiful portraits from the professional photographer. You'll find a large variety of package options, with private shoots and no sitting fee, and your images will be retouched and printed on quality paper ready to be sent to your home on your return. Put your skills to the test with this huge deck chess set - why not challenge family and friends, or take on a fellow passenger? The romantic Hearts & Minds wedding chapel is an intimate setting at sea for your special day. Begin your journey as newlyweds with Princess Cruises' wedding cruises. Situated near the teen and youth centres on the Sun Deck, families will find an outdoor play area for youngsters, as well as a refreshing paddling pool for little swimmers. Peruse an extensive collection of modern and classical art in the gallery and exhibition, with lectures highlighting some of the world's greatest artists and their work. Champagne art auctions provide an opportunity for guests to bid on and purchase some of the artwork as a memory of their cruise. Admire sweeping ocean views on a leisurely jog around the cruise deck. Snap up excellent duty-free deals on your favourite designer brands, including Swarovski jewellery, Chanel fashion accessories, and Clinique make-up. Souvenirs, local crafts and keepsakes make the perfect gift for returning home. Dreaming of your next cruise already? 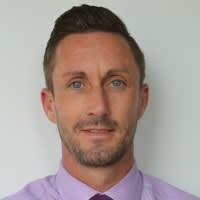 The Future Cruise Sales team are happy to help you find the ideal itinerary and Princess Cruises ship for you. As part of the shopping experience onboard, Calypso Cove is the place to find spirits, logo & fashion wear, and all your miscellaneous items like magazines, souvenirs, and sundries. 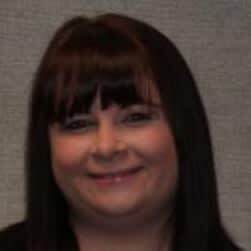 Treat yourself or a loved one to an exquisite item of jewellery from Facets, offering men's and women's' watches, necklaces and stunning rings. Meridian Bay offers huge savings on fashion jewellery, charming accessories and gifts. Enjoy tax and duty-free savings on your favourite fragrances and cosmetics, including Estee Lauder, Lancôme and Clinique. Linger in the relaxed environment of the Lotus Spa®, where you'll find a variety of treatments from aroma stone therapy to detoxifying ocean body wraps. The Lotus Spa® pool, plus 2 hot tubs, is a quiet area in which you can tuck away in tranquillity. The fitness centre features state-of-the-art equipment, including cardio machines and weights, to help you keep on top of, or start a new, fitness regime. If you prefer to workout as part of a group, you'll also find a range of classes and courses, from Zumba to spinning. Aerobics is a fun-filled activity that is sure to get the hearts of the young and the old racing. This exclusive, adult-only retreat is inspired by the spa with light meals and massages available and influenced by English gardens with a relaxed, outdoor setting. 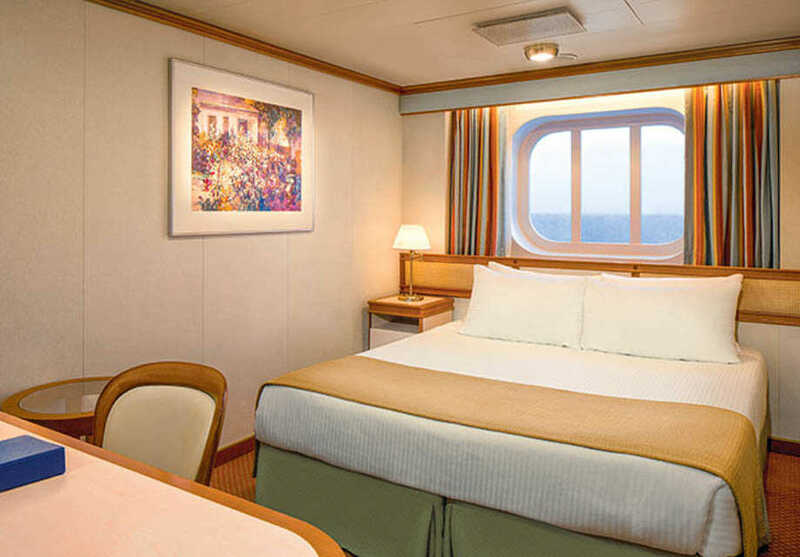 Princess ships are outfitted with modern furnishings and deluxe amenities including nightly turndown and 24-hour room service. Enhance your voyage with a suite and receive added benefits, including priority embarkation, welcome treats and speciality dining reservations. 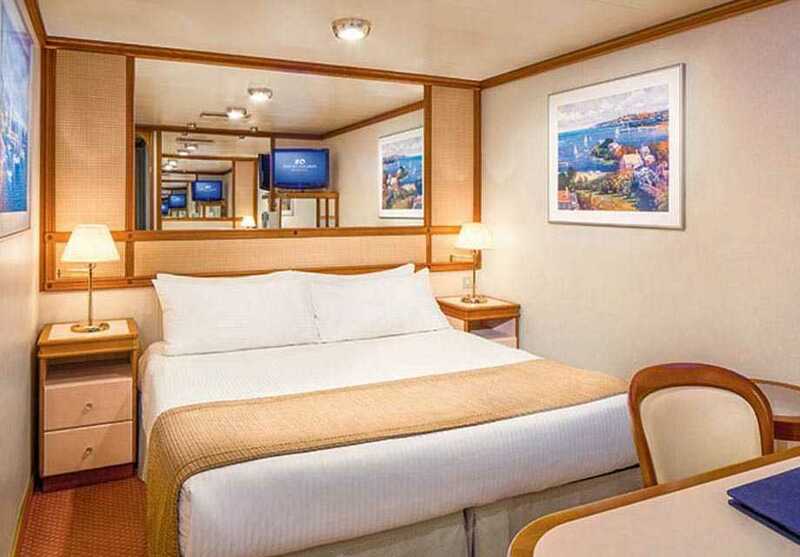 Warm and welcoming, the Interior room is situated on the inside of the ship, with two twin beds and a small desk area. Some also have Pullman beds to accommodate additional passengers. Providing warm, natural light, this Oceanview Room features a picture window or porthole with partially obstructed views of the ocean. Some also have Pullman beds to accommodate additional passengers. Richly appointed with modern amenities, the Oceanview Room features a picture window for memorable vistas. Some also have Pullman beds to accommodate additional passengers. 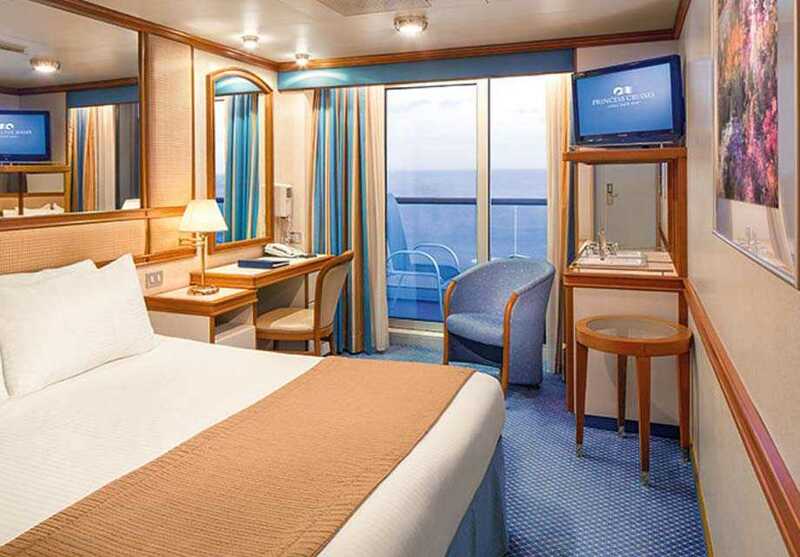 Delightful staterooms feature outstanding ocean views from your private balcony. Some also have Pullman beds to accommodate additional passengers. 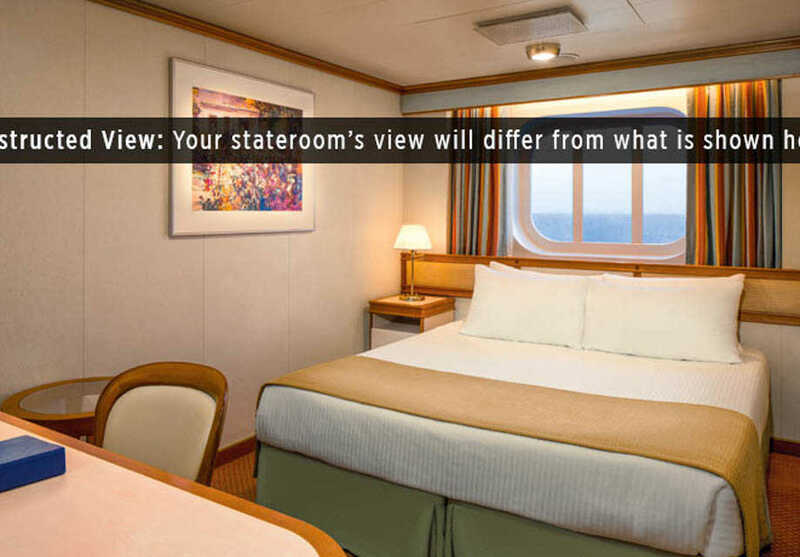 Premium Balcony rooms feature furnished balconies, some of which are rear-facing for dramatic wake views. Select rooms also have Pullman beds to accommodate additional passengers. A lovely suite perfect for a couple, the Mini-Suite includes two twin beds, as well as a luxurious sitting area with balcony. Some also have Pullman beds to accommodate additional passengers. With the same great amenities as the mini-suite but with added Club Class privileges, these suites are intimate and welcoming. 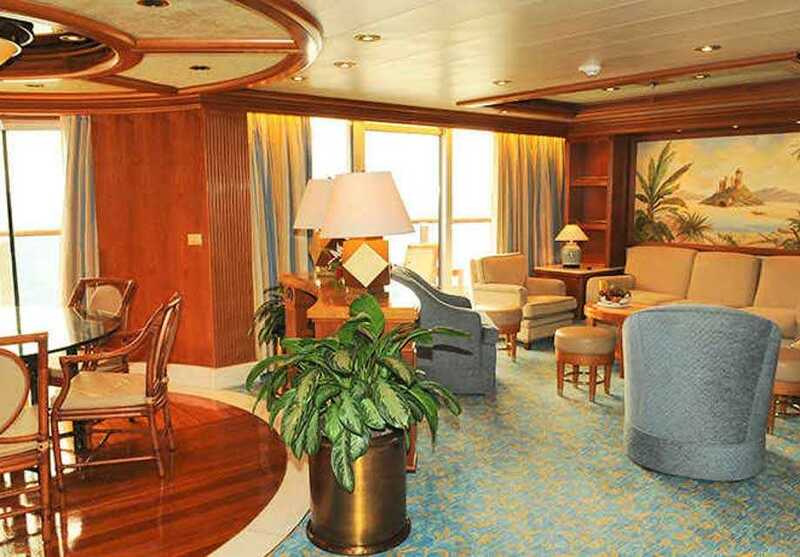 VIP touches include Club Class Dining, priority embarkation and disembarkation and welcome Champagne. Expansive family suites offer ample space for a family of four, with two bedrooms and a separate living area leading out to the furnished balcony with patio furniture for four. These spacious suites carefully blend indoor and outdoor living, with a large furnished balcony as well as a bedroom and sitting area with sofa bed to accommodate an additional guest. The luxuriously-appointed Grand Suite features a cosy bedroom and sitting area, some of which are furnished with a fireplace and wet bar. 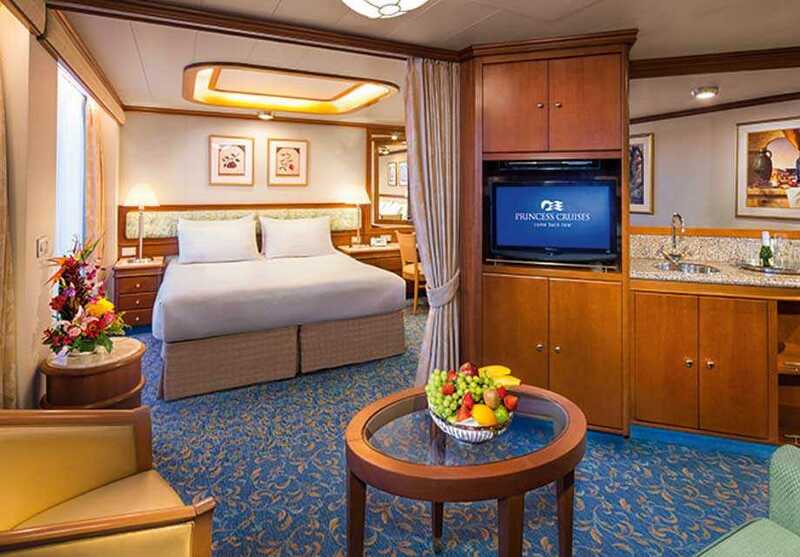 Suite services include enhanced turndown each evening and a private portrait sitting with Princess Cruises' onboard photographer.